Is anybody else blown away by the fact that it’s fall already? We can’t believe we are already working on things for next year (and we’ve got some seriously cool houses and helpful home buying materials coming your way). But to soak up that last little but of summer, we’re sharing our Top 10 Sold from Summer 2018. And no we didn’t miscount – we just couldn’t narrow down our choices any further! So here’s our top ten… plus two more. After an incredible transformation, this home was quick to go off the market. And it’s no wonder – the golf course views and copious amounts of space to enjoy inside and out made this place truly something to behold. | Search similar properties here. This one is for our farmhouse fans. The black and white kitchen, subway tile backsplash, and impeccable neutral paint choices throughout made this swoon-worthy home one of our all-time favorites. And those perfectly imperfect hardwood floors? Don’t get us started. | Search similar properties here. Log homes in this area can really be wonderful source of artistic expression. This particular home has so many custom wood finishes, inside and out, that it was a shoe-in for our Top 10 list. | Search similar properties here. You would never know by looking at the pictures of this peaceful three-acre home that it’s only minutes from downtown Leesburg. We were obsessed with every detail, down to the simple black window frames that gave the living room some serious character. | Search similar properties here. A modern kitchen and open concept living in the middle of beautiful Fauquier County? Count us in! With a generously-sized kitchen like this, open concept living, and views of the countryside, this home is a commuter’s dream. | Search similar properties here. This home boasted some seriously spectacular views, with all the comforts of a suburban-type home. It’s no wonder it went off the market in less than a week. | Search similar properties here. There is just so much character in this home we had to include it in our round up. We love the historic charm and blend of old and new. Besides, who doesn’t love the look of hand-chinked logs mixed with a stone exterior? | Search similar properties here. It might sound strange to say we included this house for the storage – but that’s exactly what we did. We loved the use of so many drawers to help keep the kitchen über-organized and the library setup in the dining area for every cookbook you could ever hope to have. | Search similar properties here. Having a wrap around porch in the middle of three open and perfectly-manicured acres should be a requirement on any home – because on this one it looks stunning. | Search similar properties here. Another farmhouse favorite, this sweet little home had some of the best staging we’ve seen this year. 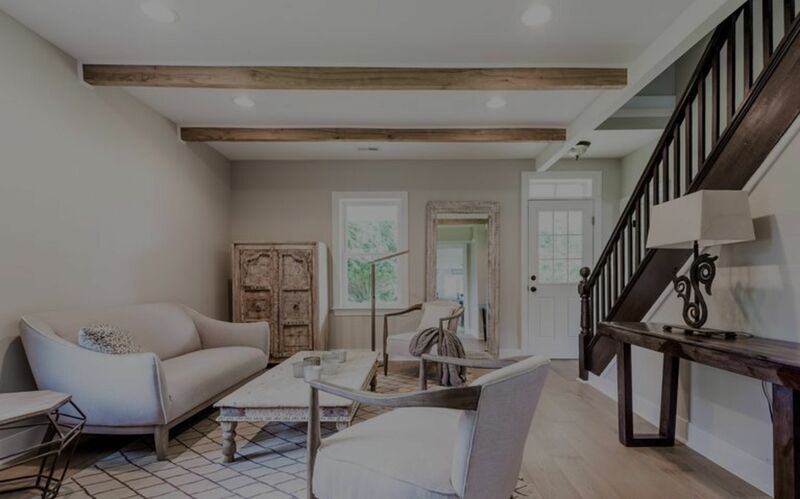 The neutral and antique-style pieces perfectly complimented the grey walls, black staircase, and exposed beams. | Search similar properties here. This home was such a bargain! Not only does it feature flawless interior design, it also has a spacious and superb basement apartment. The farmhouse door on the office space was also a favorite feature of ours. | Search similar properties here. Modern meets hunt country in this contemporary townhome. We loved the beautiful brick exterior almost as much as the clean, sleek lines inside. | Search similar properties here.